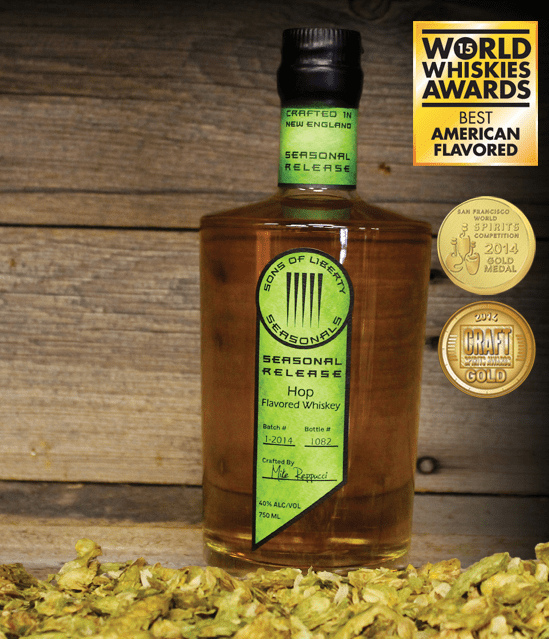 Remember last year’s Pumpkin Spice Flavored Whiskey from Rhode Island’s Sons of Liberty? Well, here’s another seasonal, the more straightforward Hop Flavored Whiskey. This whiskey started its life as an IPA. After retaining the IPA flavors through distillation we aged the whiskey in American oak barrels. Once the aging process was complete, we finished the whiskey by dry hopping with Citra and Sorachi Ace hops for bright and complementary floral notes. That all comes through quite clearly in the finished product, and this Sons of Liberty release cuts a profile similar to many other hop-flavored craft whiskeys I’ve had, pushy with hops up front and roasted cereal and a touch of popcorn notes emerging after. There’s a bit of hospital character and furniture polish up front on the nose, but the body sticks with the hops and cereal combo pretty closely. As the finish emerges, some orange peel and some tobacco notes emerge. Curious stuff, but its youth speaks even louder than the hop flavoring. Beer nuts should particularly seek it out. 80 proof. Reviewed: Batch #3 (2015 release).